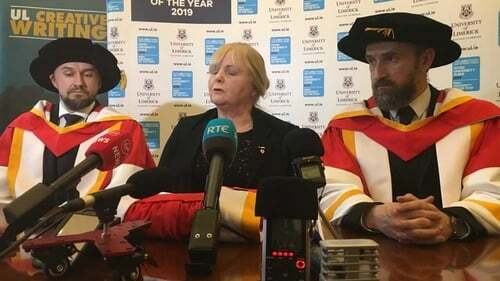 Cranberries band members Noel and Mick Hogan along with Fergal Lawlor were made Honorary Doctors of Letters at a special ceremony at the University of Limerick (UL) today. A posthumous honorary doctorate was presented to Eileen O'Riordan, mother of the band’s late lead singer Dolores O'Riordan who died a year ago last Tuesday. Cranberries brothers Noel and Mike Hogan said it was a huge honour to be conferred with the Honorary Doctorates. It represented a full circle for them as they started out 30 years ago at UL doing gigs. They said they think Dolores would have got a great kick out of the honour telling her brothers and family she was now more qualified than they were. Her mother Eileen said she believed Dolores was there with them in spirit today. She said that Christmas was a very sad time without her adding that it was a great comfort to know the enormity of love and affection people had for her and said she tells Dolores' children this frequently. Noel Hogan said they never anticipated the outpouring of support following Dolores’ death. He said the reaction to their new song 'All over Now' has been amazing. The song was released this week on the anniversary of Dolores' death. Third band member Fergal Lawlor was absent from today’s ceremony and Noel Hogan accepted his scroll on his behalf. The university said it had initially planned to present these doctorates to The Cranberries in April 2017, but rehearsals and promotional work prevented the band being available to accept the awards at that time. Dolores died on 15 January 2018, but her band mates say she was aware of the university's plans to honour them.